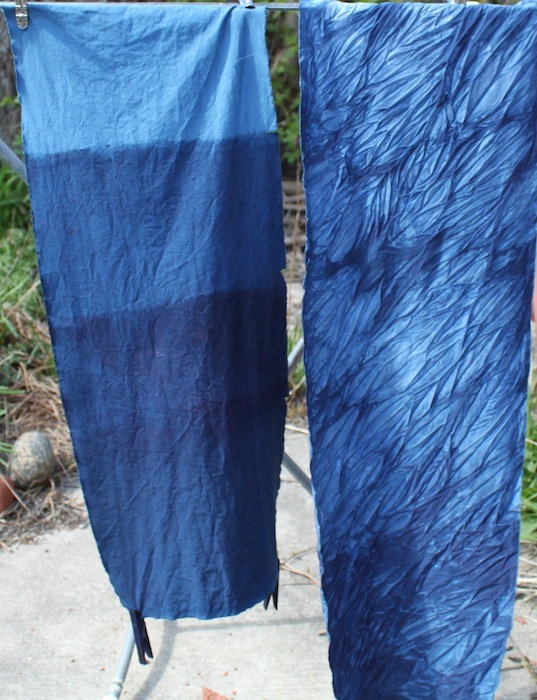 A few weeks ago, a friend and I spent 2 full days dyeing fabric using Indigo. It was great fun and I made some beautiful pieces of fabric. 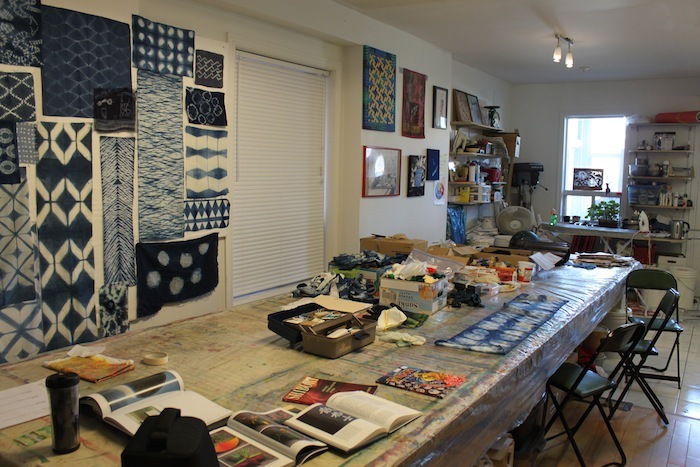 The workshop was held at the Colour Vie Studio owned by textile designer and teacher Gunnel Hag. 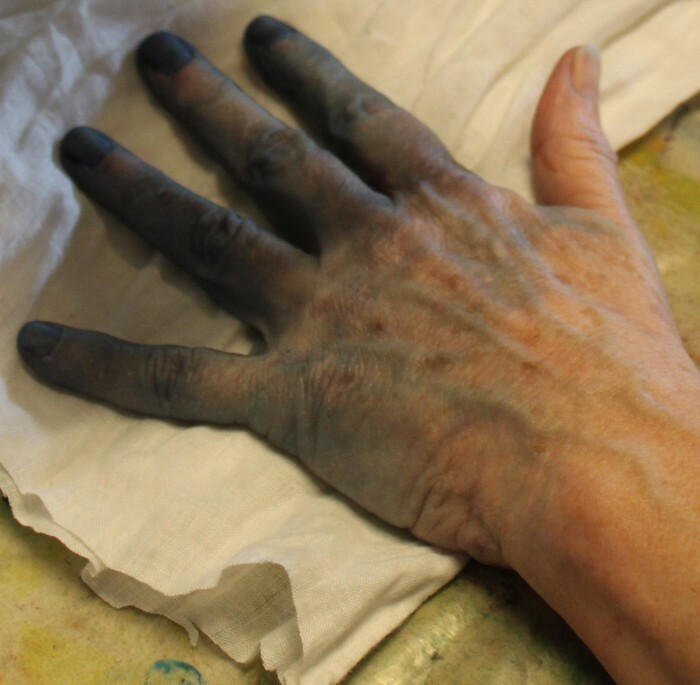 The 2 day workshop “The World of Indigo” was taught by textile designer and indigo dyer extraordinaire Pam Woodward. Pam had a wall of samples, each one more gorgeous and inspiring than the last. I especially wanted to try making something similar to the one above. 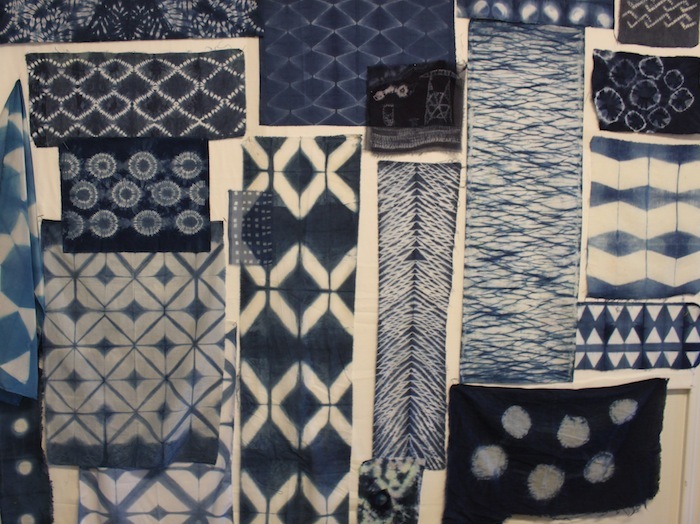 Indigo is a plant based dye and the process differs slightly from Procion MX dyes which I’ve used in the past. It’s important not to add oxygen to the vat of indigo, so care needs to be taken adding and removing fabric from the dye pot. The metallic sheen on the surface means that the solution is ready to be used. When the fabric is first removed from the vat, it is a green colour. The piece changes colour from green to blue as the fabric is exposed to the air and oxidization occurs. It’s like magic seeing the colour change! Our first piece was dyed with repeated dips in the vat, introducing less of the fabric each time to give an ombre effect. 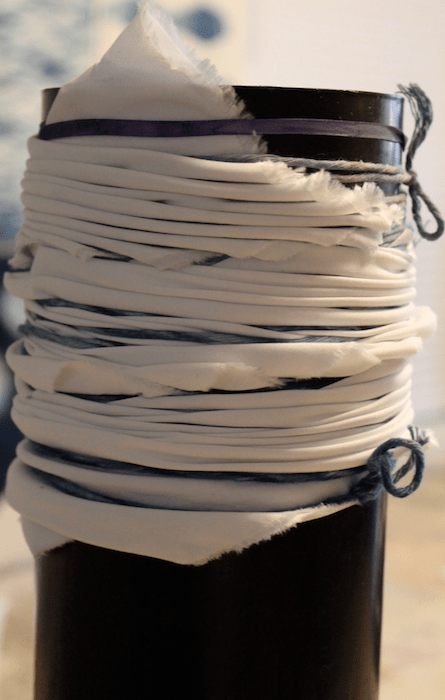 Our second piece was created by wrapping the fabric around a PVC pipe, wrapping the fabric with string and then pushing it up and twisting it around the tube tightly to create small pleats. 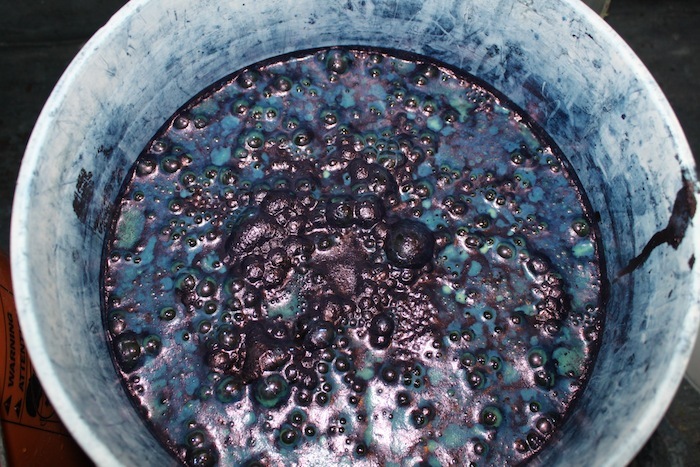 The pipe was submerged into the dye about four times, oxidizing for 20 minutes or more between each dip. 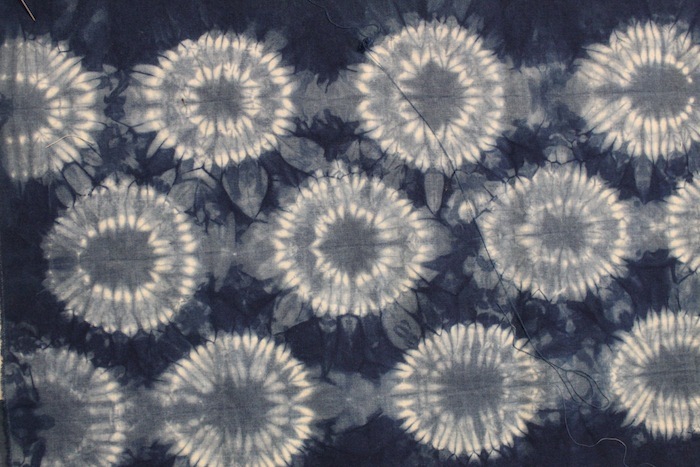 When I unfolded the fabric, I found the dye had created a beautiful diagonal movement with leaf shapes. This is the PVC pipe with the fabric ready to be submerged into the indigo vat. This technique is called Arashi. I dyed a few more pieces using variations of this technique and it’s one of my favourites. Every time you unwrap the tube it’s a surprise. This is what happens when you have a leak in your glove! 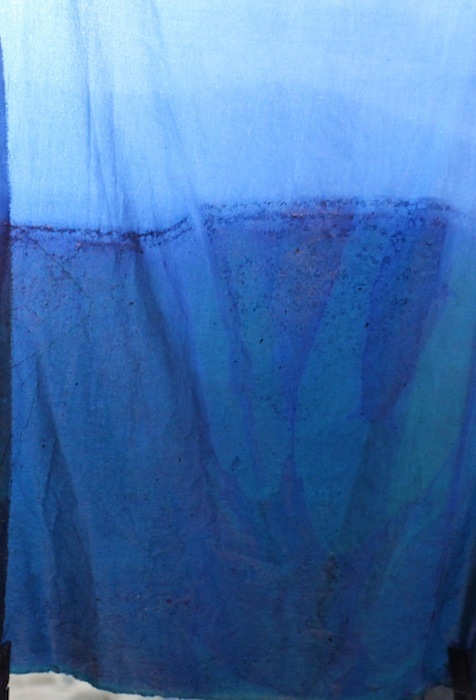 Next week I will have more photographs of the fabrics created and the techniques learned during the indigo dyeing workshop.